Yesterday’s post was about how after watching video of an actual birth, we concluded that the birthing process wasn’t really for us. After seeing you dance around — and wave! 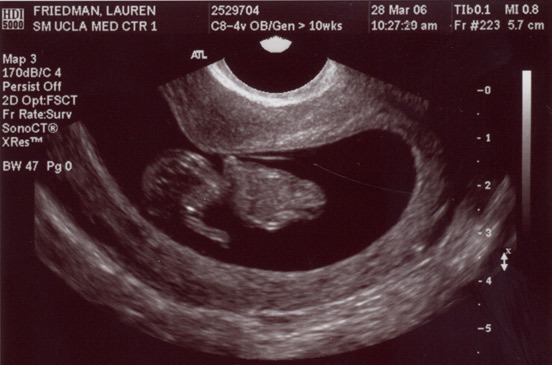 — during today’s ultrasound, I’m willing to reconsider. Comments Off on Okay, we’ll have you. Lauren and I just watched a video online of the birthing process. Slowly but steadily, I am beginning to feel more human again. My appetite is starting to come back, I’m not quite as tired, and the nausea seems to be dwindling down to isolated incidents here and there (though still occurring daily). In other fun news, Lex and I went to the mall today and had fun walking around a baby store (just to look). We also went to Motherhood Maternity, where I purchased two new bras (an absolute necessity at this point! ), a pair of maternity pantyhose, a cute little tank top that was on sale, a package of anti-nausea Preggie Pop Drops (though we are currently impatiently awaiting an internet order for the lollipops), and a book for Lex. I had such a good time at both stores. Right now it feels like I belong to this secret club – secret because aside from me and Lex, nobody who we see daily knows about you, baby. Going into the stores was fun because I could talk about being pregnant with the sales people and openly enjoy being pregnant. Also, seeing all of the clothes for “really pregnant” women and the little baby clothes and furniture sparked a lot of imagining and excitement for me and Lex. We are both so eager for October to come. 10 weeks on Monday – almost one-fourth there! All our big life changes at once. Since is a time for life changes, we’re not JUST pregnant with you, little baby — although you’re certainly at the Head of the Big Life Changes class. Yesterday Lex and I observed that over the past few days, I have been noticeably more relaxed and laid back – quite an achievement for someone as “Type A” as me. Today, I was driving to my study group for my upcoming exam for my Masters degree, and I called Lex to tell him that despite the ridiculous Los Angeles traffic (which was worse than usual due to a police chase), I was having a jolly old time, singing along to a cd. Okay, so pregnant women have the reputation of being big eaters, right? Then why is it that all food – even water – is SO unappealing to me right now? I’m trying to eat as healthily as I can, but it’s been very hard, especially during the last week. I had a great conversation with my mom yesterday, and she assures me that right around the beginning of the fourth month (we just started the third) my appetite will come back with a vengeance. I’m taking my vitamins, so I know I’ve got all the nutrients I need, but I do worry about calories, and I know Lex is worried about my eating, too. We want to make sure you’re healthy, baby. Oh, and it’s really bizarre to feel hungry and nauseous at the same time. That I had not been feeling my best at work this week was apparent to both Kevin, my current supervisor, and Tracey, my supervisor from last year. Yesterday afternoon as I was walking out Kevin jokingly suggested to Tracey that I was suffering from morning sickness. I instead blamed it on (insert name of one of my more annoying students here)-itis, and we all had a good laugh. Today when I stopped by Kevin’s office to say good morning to both him and Tracey, I mentioned that I was feeling much better today, and Kevin laughed, saying “Well, then I guess you’re not pregnant.” I smiled, the conversation shifted to other more pressing issues for the day, and the subject was brought up no more. Today was the first day in about a week that I truly felt human again. I have been so E-X-H-A-U-S-T-E-D that I made a zombie look more peppy than a cheerleader. The nausea had also been on the rise; I came the closest I have come to vomiting yesterday morning (while hunched over a garbage can in my classroom). When I woke up this morning, I actually felt like I had slept, which was a welcome change. I hadn’t gone to sleep any earlier than usual last night, but I think the thing that made the difference was that I didn’t have to go anywhere after work yesterday, so I got to spend more time at home resting, even if I was awake. Perhaps the fact that I ate a couple of crackers this morning helped, at least with the nausea part. Whatever the cause for the change, I’ll take it.